What jig heads are you guys using on your Keitech’s? Interests:Spending time with family, bass fishing, hunting and work. Used the Keitech heads. Bought Jewel Gem heads and Gem Spins to try next trip down. Can’t wait. Yep, size of bait - I use the Dirty Jigs Guppy heads also. One big reason is they have a 1/0 hook that I use with 1/8 oz head and 1/4 oz head. I put 2.8 on the 1/8 oz and 3.3 on the 1/4. Using a shorter 1/0 hook leaves more body on the smaller Keitechs to swing free so it will really kick on a slow retrieve. 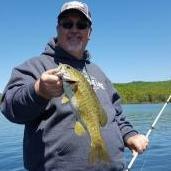 Longer baits like the 3.8 and 4.3, I'll use a 3/0 hook and you can find 3/0 hooks from a lot of manufacturers, what is hard to find are 1/0 hooks on swimbait jig heads. I haven't looked at the Berkley half-head yet. And don't forget the superglue. I really like these too. In fact it was Donna and Champ's recommendation that got me to try some and I've been using them ever since. Although on the really little Keitech's I like to use Bo's 1/8 oz. weedless crappie jighead. That is one versatile little dude. Works great with grubs, centipedes and even Ned too.